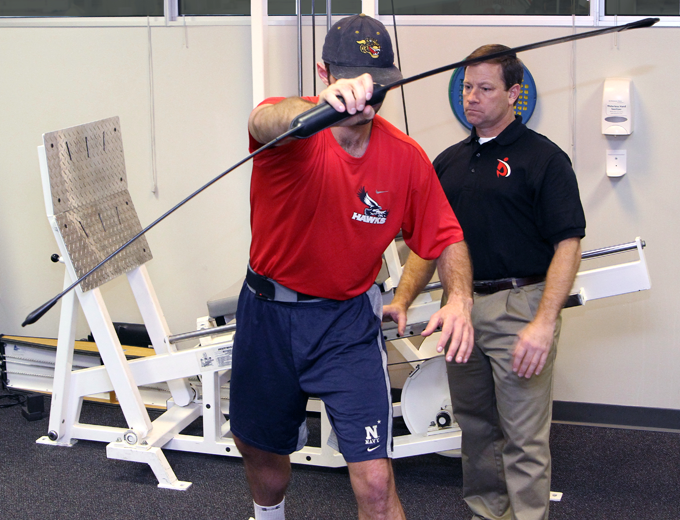 Whether an athlete is getting ready for baseball, golf, basketball, hockey, figure skating or any other athletic activity, our goal is always to make that athlete as capable as possible during dynamic movements at game speed. But how does one accomplish this? Over the past several years, I have often been asked how it’s possible to train pelvic stabilization during dynamic activities such as throwing, swinging and hitting. Should we focus on getting the entire dynamic activity “correct” all at once or break it down into sub-components. And if we should break it down, what is an effective way to do it? The first step to training pelvic stabilization or trunk control during dynamic skills is to be successful in performing controlled postures and drills. Using the correct muscles to stabilize and control the trunk is essential to applying their potential to more dynamic activities. For this reason the exercise progressions I’ve developed around the Level Belt biofeedback technology begin with controlled postures and advance into more functional postures. Training pelvic stabilization during high-level dynamic activities requires one to break down the activity into its more segmental parts. By training control of the pelvis under the spine during the segmental components of the dynamic movement, the user learns what stability feels like. 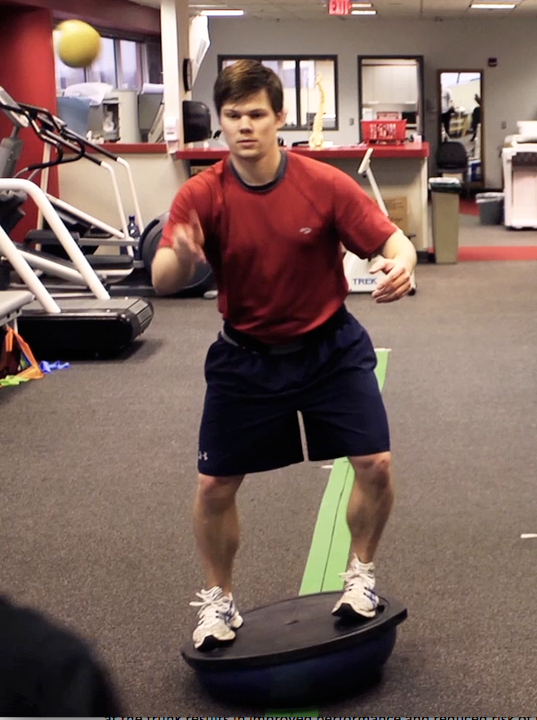 This newly learned stability can then be applied to the dynamic movement as a whole. Before Perfect Practice developed the Level Belt technology, we either watched our clients with our own eyes, asked them to watch themselves in a mirror, or recorded video to play back. There are other products out there like a motion capture laboratory, but that takes too much time, is too expensive, and oftentimes just isn’t available. And the other clinical products out there just didn’t allow us to get our clients into sitting or standing positions. Now, with the Level Belt, we are not limited to supine exercises on a table, “standing” exercises pressed up against a wall, or 3D motion capture in a laboratory—we can get the biofeedback we need in the clinic or out on the field. So how do we use the Level Belt for a pitcher? We train trunk stability in the cocking phase, the acceleration phase, release phase and follow through phase in each of their individual postures. 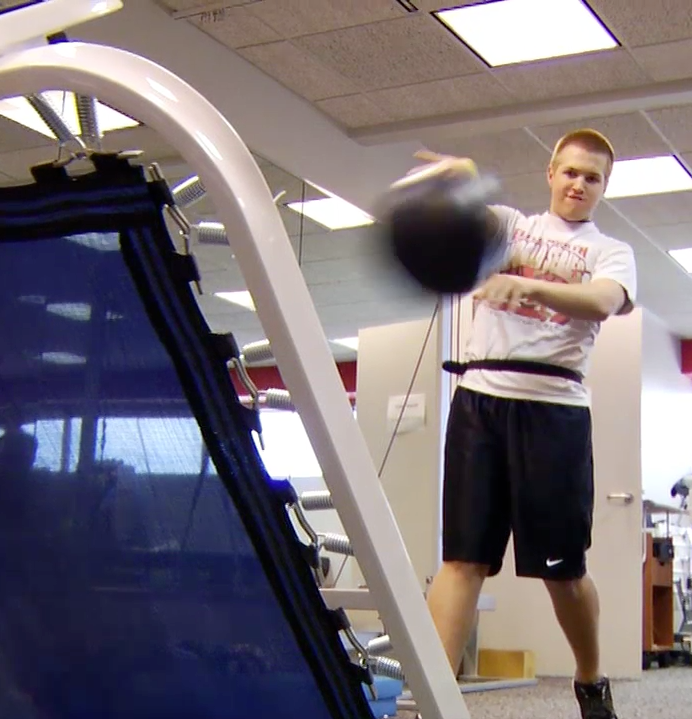 We utilize tools such as Therabands®, med ball throws, BodyBlades® and manual resistance to challenge the trunk’s stability during upper extremity activities. 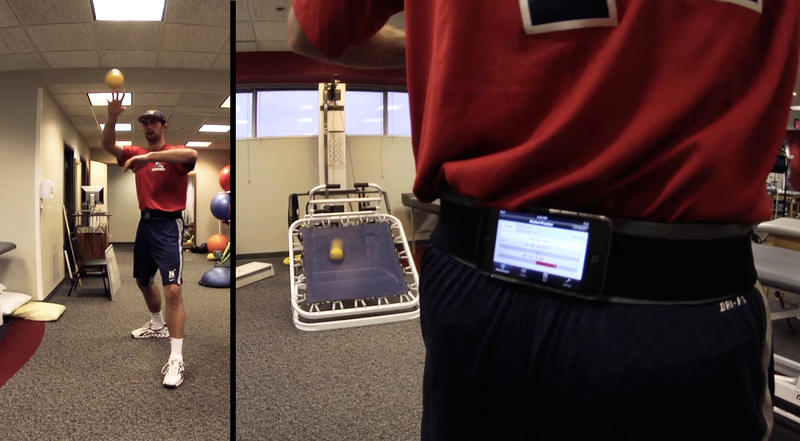 Once the client is successful at minimizing errors in trunk control at one level we select the next more challenging level available on the Level Belt app, enhancing the user’s motor learning. Enhanced stability at the trunk results in improved performance and reduced risk of injury. 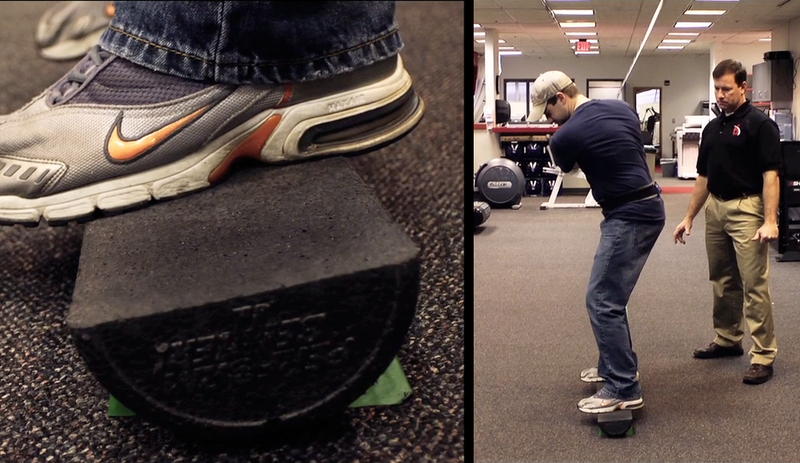 These benefits extend beyond the trunk to the upper and lower extremities as well. See how the Level Belt will benefit your clients and please share your feedback and videos with other Level Belt users via the Perfect Practice web site and Facebook page! Pelvic movement through the entire javelin throw requires your pelvis and trunk to move through multiple angles making stability training quite difficult and near impossible outside the biomechanics lab. Stability around the pelvis and trunk are most definitely needed to transfer the ground forces through the trunk to the throwing arm. Training stability of the pelvis for such a purpose is both necessary and beneficial to the athlete’s success. Jim’s “hip throws” and “Two-arm javelin throw with a med ball” are ideal examples of sport specific exercise which would benefit greatly when performed with the Level Belt. Each drill outlined by Jim requires the athlete to rotate around the hips generating power through the trunk and pelvis. Loss of power due to pelvic tilting or leaning during the explosive drills results in lost energy and throwing distance. To enhance training of the athlete’s pelvic stability simply apply the Level Belt during these rotational and overhead throwing drills assuring the athlete is maximizing their pelvic stability upon each rep. Start the athlete’s training at a threshold which they can control their pelvic tilt during most reps. Training and success will be demonstrated as the threshold is reduced and the required pelvic stability is increased during subsequent exercise days. Gains demonstrated in these and similar throwing segments can then be applied to the complete throwing mechanics of the javelin throw. I want to thank you for your comment and I hope this insight answers your question as to how the Level Belt can be applied to your particular activity and sport. 1. ‘Spine angle’ should be fairly stable from address to the top of the swing, although top power players (e.g. Tiger) actually squat a bit in backswing to generate ground force. 2. The same is true from the top through impact, i.e. either constant angle or slightly more for increased power. 3. From from impact to finish of course the golfer should stand up, so that’s probably not a phase that lends itself to this device. Do you have thoughts on the basics of an approach that would yield best results? Thank you for your purchase and welcome to the Level Belt technology. With regards to training strategies during the golf swing, your insight is correct. The entire swing plane requires contributing movements at the hips and thoracic spine. These contributing movements skew the spine and pelvis position data. For this reason, training of the spine and pelvis is performed at the various phases of the golf swing. We find it easiest to work on maintaining proper position while moving through about 30 degrees of your swing at a time–any more and you should get enough pelvic motion to trigger the feedback. 1. Address: The Level Belt is used to provide awareness of your spine and pelvis position during short and controlled takeaway, contact and early follow thru swings. As your awareness and control improves, increase the speed within this controlled swing plane. Similar training can be done at the top of your swing plane from end of take away to early acceleration and at the end of your swing during the deceleration phase. All phases do require stability at the pelvis and spine but at slightly different pelvic positions. You may also find these exercises, which I use with my clients and patients, beneficial with spine and pelvic control. First; your ability to stand at address and move your pelvis under your spine ( tuck your tail bone under you and then push it back behind) is very important. This exercise not only teaches muscle control around the pelvis and spine but will also improve your mobility in this area. Next, stand at address, cross your arms and grab the opposite shoulder. Attempt to rotate your upper trunk around a stable pelvis. Here your goal is to rotate your shoulders and not move at the pelvis. Success is demonstrated by not hearing the tone during this exercise. You can also use Perfect Practice for stability awareness with other gym activities such as cable column exercises, Swiss ball, elliptical trainer and balance exercises. I hope this brief introduction is beneficial in helping you get started with your new awareness tool for better training strategies. Best regards and do not hesitate to forward me your questions at chris@perfectpracticeusa.com or just reply to this comment. As a physical therapist, I have had the opportunity of working with members of our universities fencing team. As I am sure you are aware, the need for a strong core is necessary for manipulating the blade with both speed and accuracy. My use of our technology was quite beneficial for first teaching our fencers how to better engage their core muscles. Once learned, 2-3 sessions, the athletes was then placed in various fencing postures and challenged maintaining this stable position during both sport specific leg and arm movements. We then progressed the exercise difficulty by adding the increased demand of manipulating the blade while maintaining a stable core position. The athletes where quite amazed at how much collateral movement they were allowing through their trunk by not engaging their core musculature. It was not until we provided them with biofeedback of this movement that they realized how to engage their core musculature and better control their trunk stability. I hope this helps answer your question and sheds some light onto how you can use our technology.